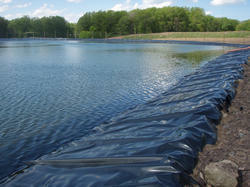 Pond Lining also called Agri film for lining is a great innovation in the field of water storage. Wide width polyethylene film prevents loss of water through seepage.This films is rugged and durable, Resistant to most hazardous liquid's, UV-resistant for exposed application. It is generally available in the width of 4 mtrs and customer required thickness and length. Can be heat sealed at site or pre factory sealed in 100 feet X 100 feet. We make pure LDPE material Pond Liner From 400 Micron to 1500 Micron to store water for various application. its cheaper than RCC water storage Tank. its Easy to install on site and can shift from one place to other if Required. it UV stabilize material for Durable services. use on various places like agriculture, industries, textile industries, construction sites and many more places. Pond Liner are made out of EPDM Liner, PVC Liner, HDPE Liner, TPO Liner and in used in Decorative Ponds for retaining water and in Golf Course for Artificial Lakes, For Rain Water Harvesting Ponds etc A pond liner is an impermeable geo membrane used for water retention, including the lining of lakes, garden ponds and artificial streams in parks and gardens. Pond liners need to be protected from sharp objects (for example, stones) below the liner and from being punctured by any objects in the water body. Protection can be provided with layers of sand, concrete, fiber-matting and other materials. Pond liners are manufactured in rolls. Strips of liner can be seamed or welded together on site; and a number of flexible types, such as HDPE, PVC and EPDM, can have their panels pre-fabricated together in the factory to fit the design shape of the pond. Application Water storage on large scale. We are a trustyworthy organization offering a wide a gamut of Geo Membrane Pond Liner. We are a trustyworthy organization offering a wide a gamut of 500 Micron Pond Liner. We are a trustyworthy organization offering a wide a gamut of Agriculture Pond Liner. We are a trustyworthy organization offering a wide a gamut of Water Storage Pond Liner. We are a trustyworthy organization offering a wide a gamut of LDPE Geo Membrane Liner. We are a trustyworthy organization offering a wide a gamut of Black Sheet LDPE Pond Liner. 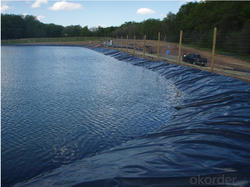 We are a trustyworthy organization offering a wide a gamut of GEO Membrane LDPE Pond Liner. Pond Lining also called Agrifilm for lining is a great innovation in the field of water storage. Wide width polyethylene film prevents loss of water through seepage.This films is rugged and durable, Resistant to most hazardous liquid's, UV-resistant for exposed application. It is generally available in the width of 4 mtrs and customer required thickness and length. Can be heat sealed at site or pre factory sealed in 100 feet X 100 feet.